Christmas is in the air! While it isn’t a national holiday in Japan, since only about 1 percent of the whole population in Japan is Christian, it’s still felt throughout the country. It is a festive and special time of the year especially because Japanese have a National Holiday on December 23rd to celebrate the reigning Emperor’s Birthday. If you are visiting before the New Year in Japan, you will find many things traditionally associated with Christmas: decorations, Christmas markets, and magnificent lights. You can also discover a few unique Japanese traditions with numerous charms that can and should be appreciated in their own right. So while it may be a little different from what you might be used to, Christmas is still felt and celebrated in the land of the rising sun. To truly experience Christmas in Japan, there is no better way than with a Japan Rail Pass in hand. You will be able to travel all around Japan by train checking the sites. It is the easiest and most affordable way to see all that Japan has to offer. The holiday season in Japan seems to be celebrated the exact opposite way as it is in western countries. In Japan, Christmas is the time for friends and couples to have parties, make plans to meet up for dinner and celebrate as much as they can. And New Year is the time of the year when all members of the family come together, visit the temple, and usher-in January 1st, with food and drinks. One fun fact about the holiday season in Japan is that Christmas Eve is the most romantic day of the year. It’s the Japanese version of Valentine’s Day. As a matter of fact, if you don’t have a date on Christmas Eve, you won’t want to be seen alone in public. 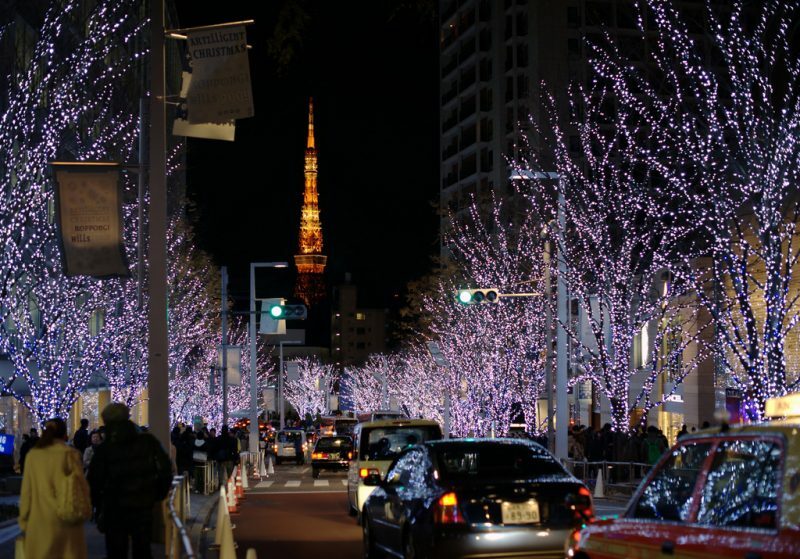 Japanese couples, especially the youngest, book dinners at romantic restaurants, the stores sell romantic Christmas gifts, and the streets are decorated to perfection to embody this most romantic day. Keep in mind that in 2018, the Emperor’s Birthday (December 23) will be a Monday, so Japanese will enjoy a long weekend. Since Emperor Akihito is scheduled to abdicate on 30 April 2019, Crown Prince Naruhito’s birthday on 23 February will become the date of the Emperor’s Birthday holiday from 2020. As we were saying, Nativity in Japan is known as a time to spread happiness, rather than a religious celebration, and all the typical things that go with it have the same meaning and connotations. 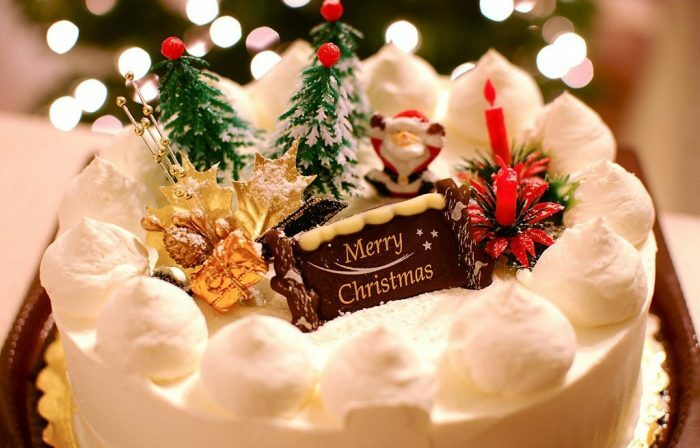 The Japanese Christmas cake or “kurisumasu keki” is sold on practically every street corner from Hokkaido to Kyushu! This dessert is light and spongy with whipped cream filling and frosting, topped with perfectly cut deep red strawberries. This beloved, and delicious, Christmas treat, very popular for birthdays too, is also seen as a symbol of prosperity since Japan rose from ruins after World War II. Every Christmas, an estimated 3.6 million Japanese families get their holiday meal from none other than Kentucky Fried Chicken. Somehow this tradition is one of the most sacred and one that really embodies the Japanese Christmas spirit. The demand is so high that people start placing their orders for the special Christmas menu six weeks in advance. And the wait in line on Christmas day is so long that it takes hours for people to get their meal. In short, doing Christmas the Japanese way means a visit to the Colonel! But why is this? The reason goes back more than 40 years to the first KFC manager in the country, Takeshi Okawara. The idea of a “party bucket,” to be sold on Christmas, came to him in a dream shortly after the company opened its doors in Japan in 1970, and after overhearing a couple of foreigners talk about how they missed the typical food at this time of the year. In 1974, KFC Japan launched a massive national Christmas marketing campaign and proved to be a huge success. Today, it is a core part of their tradition and has become the most popular meal for Christmas in Japan. Although being a pricey tradition, it really is about more than just the chicken. It means entire families getting together and sharing a meal, and that is priceless, isn’t it? Nobody does it better than the Japanese when it comes to over the top expressions of festive joy. The entire country goes crazy for illuminations! Shopping malls, restaurants, and public areas have the most incredible display of lights you can imagine that make all passersby really get in the Christmas mood. Also, from middle November until Saint Valentine’s Day there are seasonal lighting events all over the country. From small scaled decorations to spectacular audiovisual projections. The most famous and popular landmarks have their own unique festive lighting displays, which are exceptionally beautiful, for instance, the Tokyo Station in the capital, the Kaiyukan Aquarium in Osaka or the onsen near Nagashima, Nabana no Sato. From the North to the South, Japan hosts typical Christmas markets from the beginning to the end of winter season. While visiting Japan at this time, you will be able to find everything from delicate tree ornaments to mulled wine. We suggest you visit the Tokyo Christmas Market, sponsored by the German Tourism Association and the German Embassy, from December 16th to 25th in Hibiya Park, 11am to 11pm, every day. There is, also, a Christmas market in Sapporo that we strongly recommend you check out. This event offers guests a happy and fantastic Disney-style Christmas, with fireworks, special merchandise, candy giveaways and special and delicious Christmas menu. 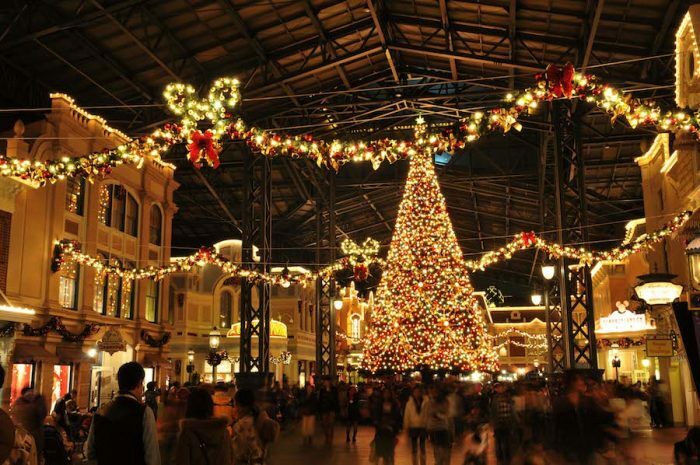 Tokyo Disney is a great place for families with children to spend their Christmas holiday in Japan. Is it really Christmas without a little holiday shopping? During this most festive period, you will be able to find traditional trees, decorating ornaments and many other products on sale at most major shopping centers and department stores, particularly in the big cities. As previously mentioned, exchanging gifts on Christmas Eve has become a tradition between couples, but hasn’t expanded beyond that. Japan has its very own exchange-gift day in December, a kind of a Japanese Secret Santa, a work-culture tradition of Oseibo (end of the year). Also, New Year presents are a huge deal in Japan. Note: Since Christmas is not a Japanese tradition, all stores in Japan are open as usual times during this period, but New Year is one of Japan’s biggest holidays, and also one that attracts the most tourists. Many stores, restaurants, and entertainment attractions are closed between December 29 and January 4. December and January are good months to visit this majestic country, as the weather is usually sunny and dry. However, in northern Japan and along the Japanese coast, there is lots of snow at Christmas so it can be one of the best times of the year to visit. The upside to this is that the conditions for winter sports are unbeatable and definitely worth a stop in one of the Japanese onsens. The Japanese Alps have some of the top ski resorts in the world. Want to know the secret of how to see them all during your journey? The downside of a winter trip is that the days are shorter (sunset is around 5 pm in Tokyo). However, as the saying goes: Early to bed, early to rise, makes the man healthy, wealthy and wise… and as said in Japanese, Merii Kurisumasu to all of you, lovely travelers.